What are your goals? What is your vision in life? This is rather the most important question asked in an interview because this determines your commitment and dedication towards achieving your goals and aim in life. The person who is taking your interview mainly asks such question as to have a basic idea of how much organized and planned you are about your career. How to Define Your Career Goals? What is your aim in your life? What are your long term plans or goals? Where do you see yourself 5 years from now? How confident are you to fulfil all these objectives in your life? How will you put your skills to work to achieve your vision of life and objectives in your life? How will you try and progress yourself to reach and achieve your vision in life that you have set for yourself? Such type of questions will help the employers to understand you better and your plans for the future. They also assess whether your plans match the organization’s goals or not. Though this looks a bit tricky, you should answer it smartly so that you look organized and clear before the employer in the interview process. Your answer should comprise your short term and long term goals. So here are some of the points that you need to include in your answer. Now if you are clear with solutions for the above points then you can easily comprise a solution for this question. Now let us see, what are the common objectives of an interviewer to ask these questions. If the interviewer is asking ‘what is your vision in life‘, ‘what are your goals in life in a job interview‘, his intention is to know your expectation from the role you may play in that firm or organization. The Interviewer always expects a Systematic answer from you so that he/she can understand what you want or your objectives (i.e under 5 year goal plans that you have set for yourself). Moreover the question is asked to know for how many years are you going to be determined towards your goal and how much effort are you going to put to achieve them. Also having a vision is used to determine your key strength and your mental power so that you have realistic goals. If a candidate fails to answer this question with hesitation, to answer this question promptly the interviewer may cut your name off the list and will also deem your confidence in yourself. Its better to be always prepared for ‘what is your vision in life’ interview question so that you have a lot of confidence to tell about your objectives and the vision in your life that you have set for yourself and it will be very clear to you while giving your interview. The interviewer when asks you this question, its better to start your way through by first telling about your past goals which you have successfully achieved in life and then tell about your future life vision. Having a vision for you will always keeps you focused. Don’t be too specific while answering the question, specifically if you are not fully aware of the career path of this company. The simpler your answer will be, the better interviewer will be able understand you. Be truthful, but don’t speak narrow goals. Be broad enough, while listing your goals, so that the interviewer does not raise doubts regarding your appointment to his job opening. If you will have a million of ideas running in your mind, or zero idea, then delivering a perfect answer will surely be very difficult. You might be exploring multiple career job options, especially if you are at entry level. But, this is not your career counseling session. So, don’t fall into the mistake of discussing what all is running in your mind. Give an impression that you have an ideal plan to achieve what you desire. Practice makes you perfect. Since, you are already aware that this is one such question that most interviewers may ask, so it is best to prepare for it in advance. Take a piece of paper and list down things that you really want to achieve in your life. Not only preparing for an what is your mission in life answer in advance is sufficient. It is also essential that you practice it a couple of times, before the final day. This will not only make you feel more confident during the interview session, but might also get you to the job. There is no perfect, try precise way to answer this question, as your goals depends on what is really important for you. But, by considering these tips or points, you can surely frame your goals in a sincere and presentable way that can help you get hired for the job position you desire to. Separate personal goals from professional ambitions and then mark out which among them are short term and which are long term achievements. This evaluation will help you frame a better answer to this question. While speaking about your goals, it is essential that your short terms goals are interrelated with the long term goals. Your short term ambitions must act as stepping ladders towards achievements of your long term goals. Also, your goals and career vision must be related to the job that you are interviewing. Once you have listed and segregated your professional goals, then it is necessary that you stay focused on them, even while answering. Discuss about your goals and do not deviate from them as this may make the interviewer feel that you are confused and not well planned about your career. In case you are feeling conscious, or you seriously don’t know what to say, then still stay relaxed and calm. You can ask for a glass of water, and simultaneously think what you can speak. But try your best that you don’t leave the question unanswered. Always know what you should speak first and what last. Maybe your answer might not seem perfect to the interviewer, but try to deliver an answer that is well organized. Don’t mix your goals or don’t add a single goal to any lists of short term and long term. Give an answer that seems well planned to the interviewer. In case you need to pursue further education along with the job to achieve your long-term goals, then you can discuss about that as well. Also, discuss about your short term goals first and then about your long term goals. If you really want to impress the interviewer with a modest answer to this question, then it would be wise if you relate your goals to the job position. Discuss why this job is very much important to you and how you can achieve everything you desire by getting hired to this position. State it to the interviewer that this is not the end, but might be a great step towards accomplishing both your long term and short term ambitions. The interviewer may have asked this question to investigate your commitment or interest towards his company. Obviously, you will not work in the company forever, but it is vital that the employer sees your interest and drive towards working for the company. Make sure that the interviewer believes that you are really ambitious and you will not leave the job, no matter what the circumstances are. Make him believe that you are serious not only about getting hired to the job but also about achieving your goals. This is because interviewers always want to hire job seekers who are serious about the company as well as their personal career. Exhibit your enthusiasm towards getting hired for this job. Make it clear that you are very much motivated and excited to get this job right now. You’re enthusiastic and your confidence will give the interviewer the assurance that you are a person who will deliver best and will be assigned the task properly and will deliver quality work. So your self-confidence and Enthusiastic nature will give a good impression to the interviewer and the chances are that he may get so impressed that he may give you an offer letter right away. Don’t give narrative answers like a story. Try your best to make best out of given time. It’s better to give a brief outline of short term and long term goals. You can also discuss some really important ones. Also, don’t give a too short answer or the one-liner. It’s better if you speak out two to three short term goals and similarly few long term goals. Second, don’t act like you have been asked a very hard question. It is good to take the question seriously, but remember that you are not being judged on the basis of the accuracy of your answer. Frame your answer in a way; so that the interviewer gets reassured that you are investing time and hard work in your career path. Confidence is the key to success in any type of interview question. Even if you fall in any confusion or you have very less to speak, it will be better if you answer all with great confidence. Don’t be overconfident or fall into an argument with the interviewer to prove your point correct. Think before speaking, and try to maintain your confidence while answering a few important questions like ‘what is your vision in life’. 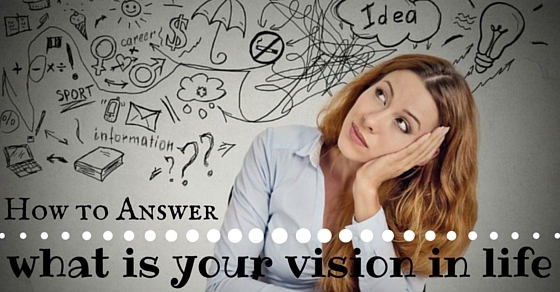 Even though this question about goals and visions sounds simple and easy but is surely a tough one to handle. Presenting here are a few mistakes that you should avoid so that nothing as a hindrance while answering these questions. Rambling through your answers or giving a long-winded response shows signs of being unprepared causing the interviewer to have second thoughts on selecting you for the job. By practising in front of the mirror will help you to gain self-confidence and set a good impression. Highlight the major key points while planning to answer for ‘what is your vision in life’ interview question. While conveying don’t plan your sentences like a parrot reader instead understand what you are going to say next and improvise your response. If you have won certificates or trophies in your school days or college I think it’s the best time to brag about it. What is your vision in life question’s answer should be properly narrated so that the interviewer doesn’t get confused. There shouldn’t be any loopholes to be dived that lead to confusion. So always be well prepared.